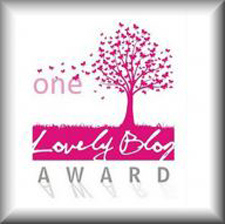 I have been nominated for the One Lovely Blog award by thehesoproject.wordpress.com – a beautiful blog where you can discover the world as seen by a keen eye and written them out with the inner beauty, wisdom and knowledge of a creative writer. Check it out! 2 Post the award picture in your post. My passion is knowledge – reading, writing, music, movies and every day life assist me in the pursuit of knowledge. I am self-conscious and hopelessly romantic. I dislike when they call this State “God’s Country”, a phrase which I consider is disrespect to God. I would love to have a dog – but couldn’t due to reasons stated in my blog of Oct 5: “Travel All-Inclusive: Tails of Affection”. I adore the genius of Michelangelo. I would like to travel more. It’s important to me. Is it possible for me to own a home in London or Madrid? I would love that. I think about my mistakes. I still believe anything is possible if you believe in yourself. The goodness of a person spreads in all direction. I would like to be kind whenever possible because it is always possible if you try. Here is my diverse list of nominations. All are great sites and are worth a visit so check them out.